Hi Guys, welcome back to avjtrickz. This month is very very special for us. So we decided to Plan Something great offer for you. We already have Giveaway page and conducting Giveaways in every month. In this special month we are conducting biggest Giveaway. This will be a great chance for you to make some Paytm cash. So don’t miss it! To participate in this Giveaway you should join by follow some instructions. However entry closed now. Congratulations to all users who have successfully joined this Giveaway & Get ready to hunt! Giveaway is conducted by 5 levels. Total prizes worth Rs.2200+ given to no of persons equal to that level . 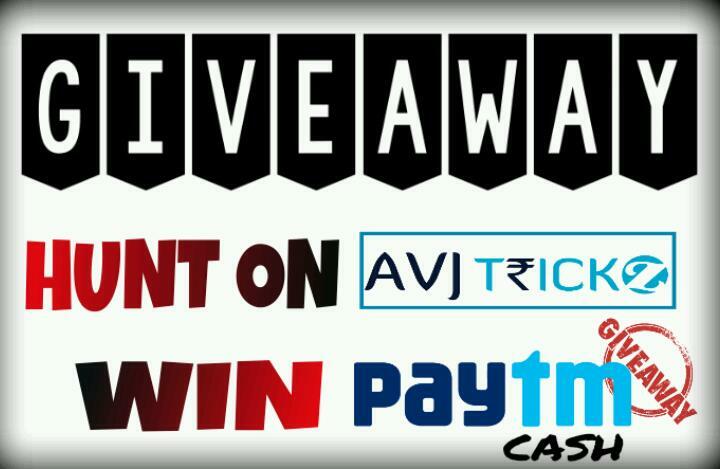 Besides this 20+ lucky persons will win extra Paytm cash. 8. If you have any doubts on Giveaway process, let’s know through comments below! Congratulations to all winners! Total 154 People Joined & 47 people participated, Thanks for your all support!